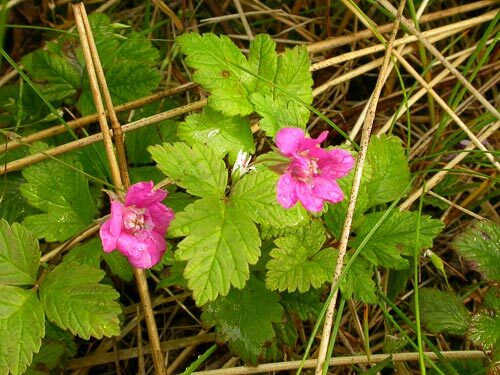 AgroAtlas - Relatives - Rubus arcticus L. - Arctic raspberry. Family Rosaceae Juss. genus Rubus L.
Perennial plant with thin, ligneous, creeping rhizome forming brood buds. Stems up to 30 cm tall, spineless, simple or branched. Leaves ternate, with long petioles and large obovate stipules. Leaflets rhombic-ovate (terminal leaflet on distinct petiolule, lateral ones quite often bilobate), thin, green, glabrous above, with sparse adpressed hairs beneath with large and dense double teeth at margins. Flowers solitary, terminal, 20-25 mm diameter. Pedicels slender, long, pubescent including stipitate, glandular hairs. Sepals lanceolate, thin-acuminate, short and densely pubescent, deflected at fruits. Petals broadly obovate or oblong-obovate, red-pink or pink. Fruits are dark red aggregate drupes. Entomophilous, ornitho- and zoochore. Propagates by seeds, root offsprings. Flowers in June - July, fruits in July - August. 2n=14. Northern Europe (Scandinavia), northern and northeastern European Russia (the southern limit of distribution stretches over Tver, Moscow, Ivanovo, Kostroma Regions where the Arctic raspberry is known in few localities), Urals, Siberia, Mongolia (north), Japan (north), North America. Mesophyte. Occurs in Arctic and forest zones, in forest mountain belt, in high mountains (up to 2000 m), in forests, wet meadows, in shrubberies at river banks, in fens, tundras. Food, medicine. The fruits have excellent taste and are eaten fresh and cooked. Due to high content of vitamins, it is also an antiscorbutic mean. Gubanov IA., Kiseleva KV., Novikov VS., Tikhomirov VN. 2003. Illustrated Manual of the Middle Russia Plants. V.2. Moscow: KMK. P.402. (In Russian). Polozhij AV., Malyshev LI., ed. 1988. Flora of Siberia. V.8. Rosaceae. P.29-30. (In Russian). Tzvelev NN. 2000. Manual of the vascular plants of Northwest Russia (Leningrad, Pskov and Novgorod Regions). St.Petersburg: State Chemical-Pharmaceutical Academy Press. P.429. (In Russian).